Art pieces like Captain Jonas take quite a while to design and complete. So many little bits of paper and hidden details. I love working on them as piecework is so cathartic to me, but I find I have to work on some single folk as well so I can feel like I'm getting things done. The little guy in the post picture is the figurine for a new art piece. I really love his hat. I like making hats. They really, er, top off an outfit. 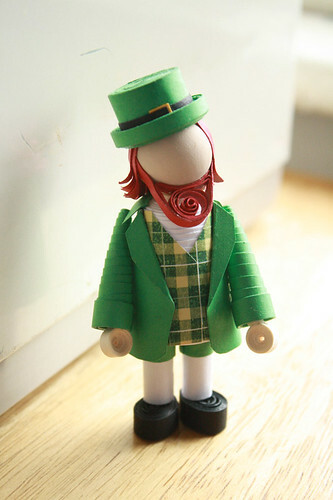 He's a leprechaun and the plan is to add a pot of gold and hopefully a rainbow. The rainbow will be a little tricky, but I have a few ideas. I hope to get him done before St. Patrick's day. What should I name him? Leave a comment if you have a suggestion. also, Seamus. good scots-irish leprechaun name.